Photographing used plastic flowers and other synthetic modern props associated with home/office décor with a 'home-made' scanner-camera, Koroshegyi creates artificial still-lifes and fake sunsets to reinterpret the traditional mise-en-scène of photography and painting. 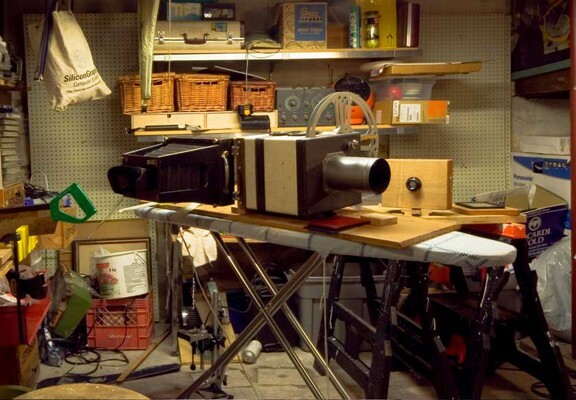 The camera itself-a fusion of modern technology and 19th century photographic techniques-was developed over 10 months of 'basement bricolage,' historical and technological research. 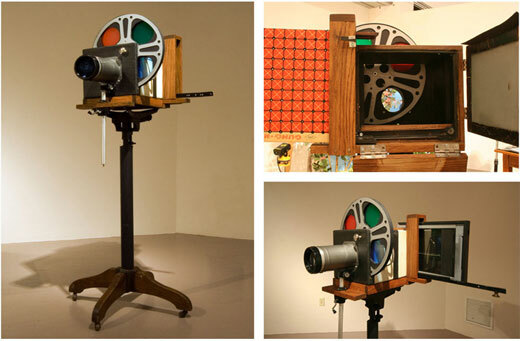 Combining donated components, found items and constructed pieces (old bellows, a metal film reel, a large lens, an archival document box, handmade painted glass slides, etc.) with a digital scanner that acts a negative to capture an image, the digital scanner-camera produces high resolution, almost hyper real images that nonetheless have a late 19th century pre-Raphaelite feel to them. 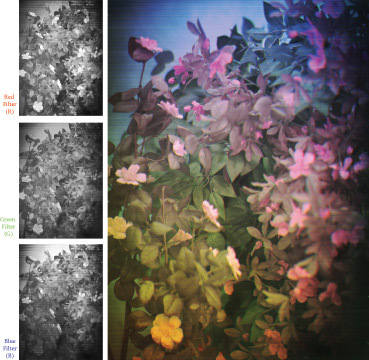 Taking a picture with the scanner-camera does not involve 'exposing' the focal plane all at once (as it normally would in a film camera) but rather, it entails reading the focal plane in a linear motion. The scanner captures the image sequentially, line by line, in short intervals of time. 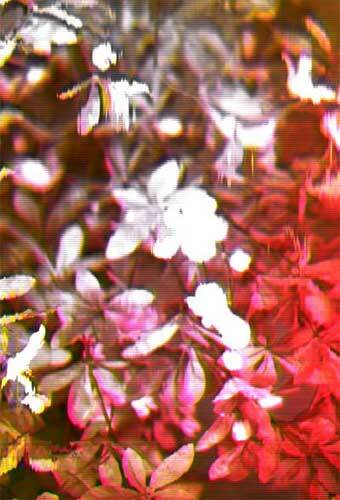 Moreover, each image is created from four separate passes of the scanner (one in black and white, another using the red filter, then the blue filter and then the green filter) and later composited in Photoshop. 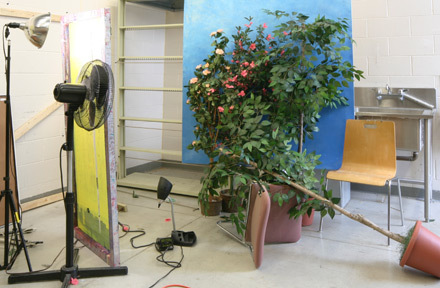 By consciously creating artificial still-lifes and fake sunsets involving decorative synthetic flowers and other domestic props within a contained studio setting, Koroshegyi introduces directed motion (using fans and wires to create movement) and varied intensity of lighting (strobes and spotlights) to discover the potential and the complexities of the imaging device. 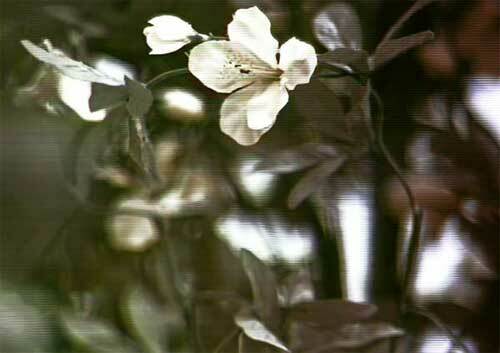 As a result, the camera records any variations in movement in such a way that motion becomes distorted (the computer registers the image information as streaking artifacts) while static objects are captured in focus.This fundamentally different approach to how the scanner-camera captures images questions the relationships between time, colour, motion, and imaging in unfamiliar ways. At a distance, a large, high resolution, colour-saturated almost hyper real image appears painting-like, as in a pre-Raphaelite tableau. 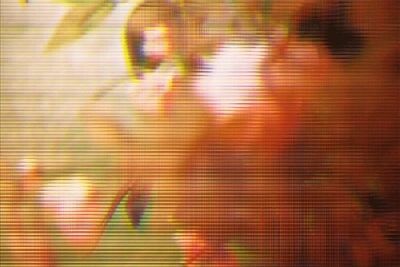 Yet upon closer examination, the unmistakable streaking artifacts and the pixilated blurs resulting from a digital camera registering motion (what the computer considers visible defects or loss of information), clearly steer the viewer from any kind of romantic interpretation of the photograph. The images are formal contradictions in photography; the tension between the painterly quality and the digital technological imprint force the viewer to question the conceptual basis of how we read the out-of-focus, the blur, the loss of ‘information’ in photographic images.